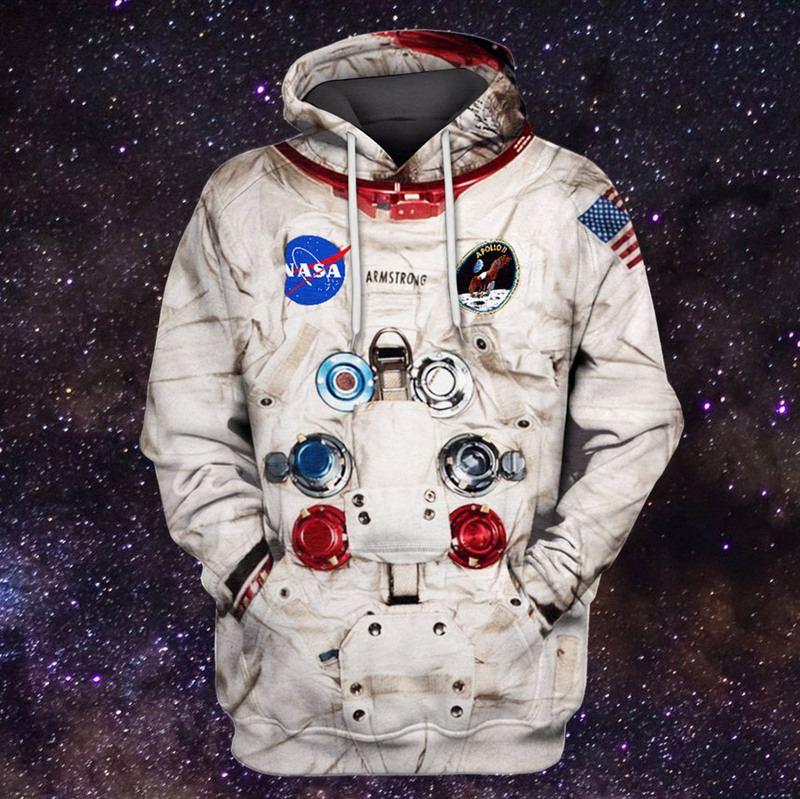 Can't help but love GearHumans' astronaut suit hoodie ($45.99). The image is a 3D-photo print of the spacesuit that Neil Armstrong wore in 1969 during his Apollo 11 moon mission. It ships with his last name on it unless you specify otherwise. 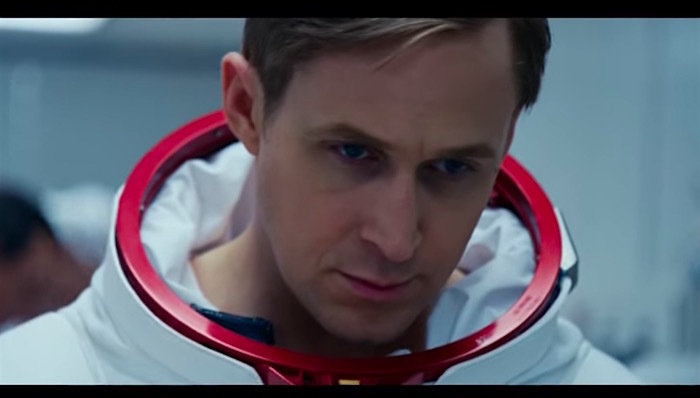 The latest trailer for Universal Pictures' First Man packs a whole lotta action and drama into a 2-minute 14-second package. The movie chronicles the life of astronaut Neil Armstrong, his first manned mission to the Moon, and the cost this mission took on Armstrong's family in the days leading up to the launch. At Kelly's house, I had the chance to ask him a question about the first landing on the moon that provoked a response that seemed poignant and awe-inspiring. Venture capitalist, photographer, and master-level space fanatic Steve Jurvetson has been digging in to his archives for snapshots and relics related to the life and legacy of the late astronaut Neil Armstrong. For instance: above, a vintage 11”x 14” X-ray of Armstrong's lunar EVA spacesuit boots dated 7-7-69, only 9 days before the launch. You can scroll through more photos here, on Steve's Facebook page. He gave a detailed answer about the hypergolic fuel mixing system for the lunar module. Rather than an ignition system, they had two substances that would ignite upon contact. Instead of an electric pump, he wished he had a big simple lever to mechanically initiate mixing. This silent film clip, posted at the Smithsonian's Air & Space Magazine blog, is one of the most amazing things I've seen in a while. First off, it shows a 1968 test run of a lunar landing research vehicle—a practice version of the lunar module that would later carry Neil Armstrong and Buzz Aldrin to the surface of the Moon. It's weird and surreal and very, very awesome to watch an LLRV rising, lowering, and swooping through the sky from the vantage point of someone standing on the ground. In general, a great reminder that we make UFOs right here on Earth. But the real crazy bit happens at the end of the video, when Neil Armstrong—who was piloting this LLRV—bails out just before the craft plummets to the ground and explodes. No, seriously. And it leads to this amazing story, which is, in itself, a brilliant tribute to Armstrong. This data visualization of the Apollo 11 moon mission gathers social and technical data from the 1969 lunar landing in video form. The horizontal axis is an interactive timeline. The horizontal axis is an interactive timeline. The vertical axis is divided into several sections, each corresponding to a data source. At the top, commentators are present in narratives from Digital Apollo and NASA technical debriefings. Just below are the members of ground control. The middle section is a log-scale graph stretching from Earth (~10E9 ft. away) to the Moon. Utterances from the landing CAPCOM, Duke, the command module pilot, Collins, the mission commander, Armstrong, and the lunar module pilot, Aldrin, are plotted on this graph. 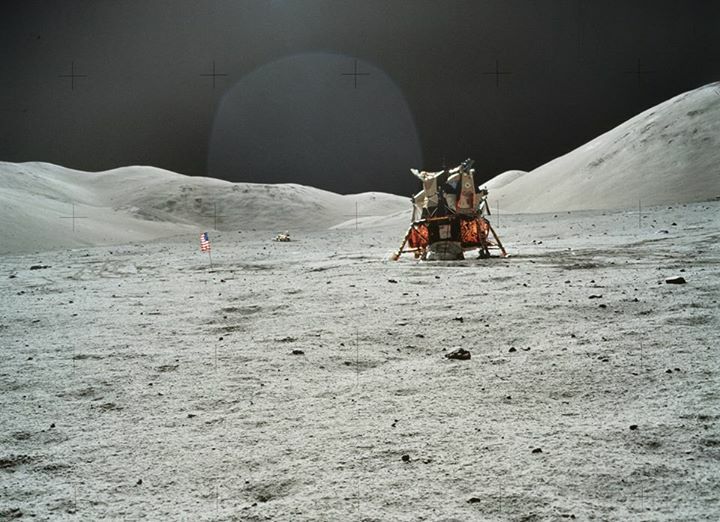 The graph is partially overlaid on a composite image of the lunar surface. More about the data presented, and the story told, at the project's Vimeo page. The project comes from the MIT Laboratory for Automation, Robotics, and Society, and was directed by David Mindell. Via Maria Popova. As noted on Flowing Data, my only disappointment is that they didn't get to the "One small step for [a] man" part!